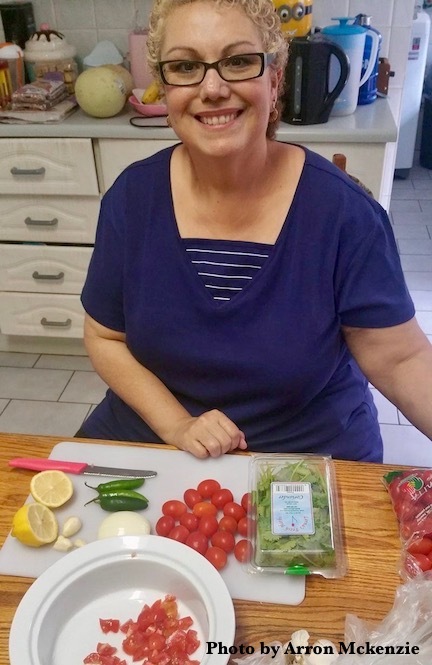 Photo Above: Bren loves making her delicious salsa for friends in Africa and all around the world. 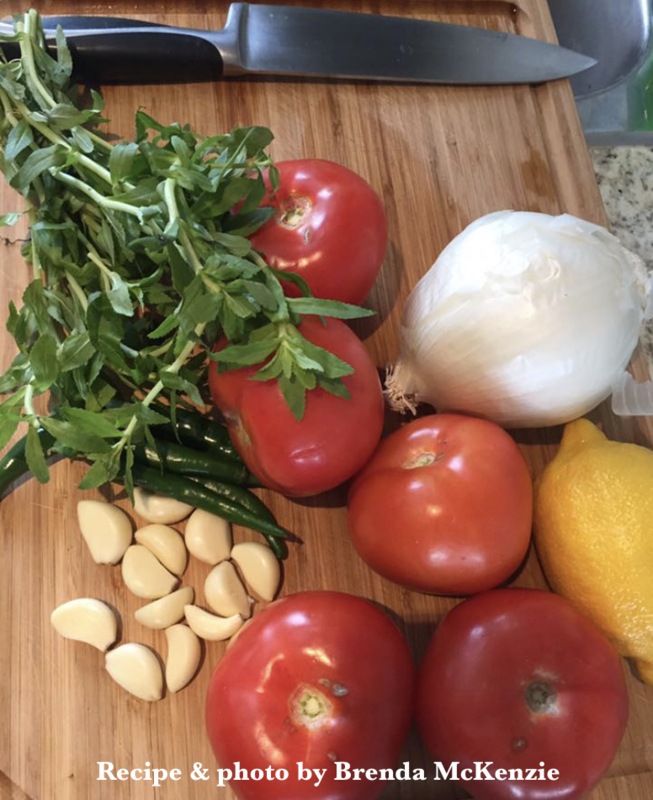 It all started with grandma's recipe, and now it lives on through Bren and anyone making her salsa. Enjoy! Home grown tomatoes take this salsa up another notch. Salsa for one, or for a big party works either way. Even guests on a strict diet can usually eat salsa. It's not served with just chips anymore. It can be served with fresh celery sticks, cucumbers, crackers, or even a condiment to fish. As a matter of fact you can enjoy salsa on just about anything. It's a must for most parties and a regular side for healthy diets. Above: The picture above is a salsa I made using sister Bren's recipe. It really is easy! I mixed all the ingredients and put about half in the blender for a couple spins, then mixed it back in with the unmixed portion. All those raw veggies mixed together for a perfect snack or condiment to a meal, and guilt free because it's super healthy. 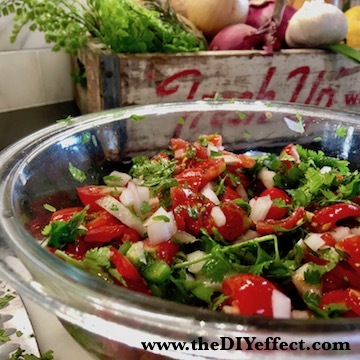 Tip: If you are short on ingredients or time consider picking up a ready made salsa and adding whatever fresh ingredients you have. 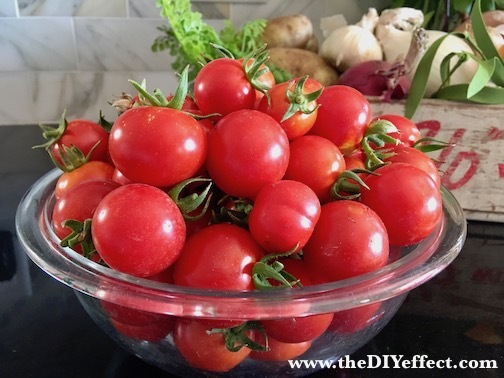 A couple tomatoes, onions or garlic can do wonders for a ready made salsa. Be sure to check the ingredients list on store bought salsa. Get one that's not loaded up with sugar, salt and other unhealthy ingredients. There is a huge selection these days so beware! Salsa recipe's vary. There are so many options. Some recipes include cumin, lime juice, and a variety of different Chile's. Even sugar is added in some cases, but if you want to keep it healthy leave out the sugar out. 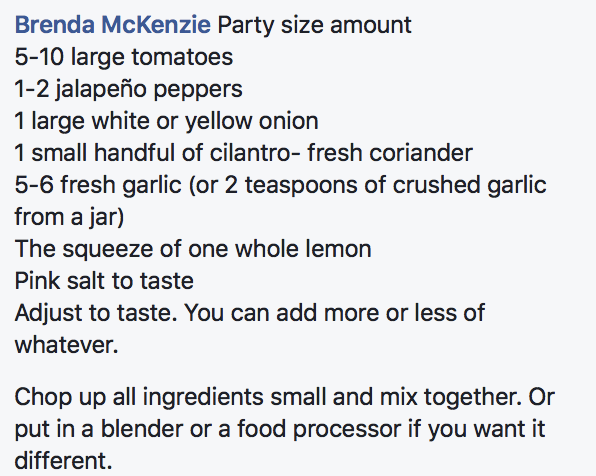 Some recipe's blend all the salsa in a food processor or blender, and some don't blend at all. Just a little smashing and stirring with a fork may be enough for your taste. Chunky is especially good as a side or a topping to salmon or anything you like.. I tend to blend it a little for dips, but not too much or it gets runny on a chip. It's all about personal preference. a type of Latin American dance music incorporating elements of jazz and rock. 2. (especially in Latin American cooking) a spicy tomato sauce.